Basic Strokes Worksheets for Small Brush Pens. Download these free brush calligraphy worksheets and get practicing! Whether you’re a newbie or experienced with brush calligraphy, it’s always a good time to practice basic strokes. It’s a great warmup exercise if you haven’t lettered in a while or got a new type of brush pen. If you’re a newbie, small brush pens are the perfect way to start brush calligraphy! They’re much easier to work with the larger brush pens. 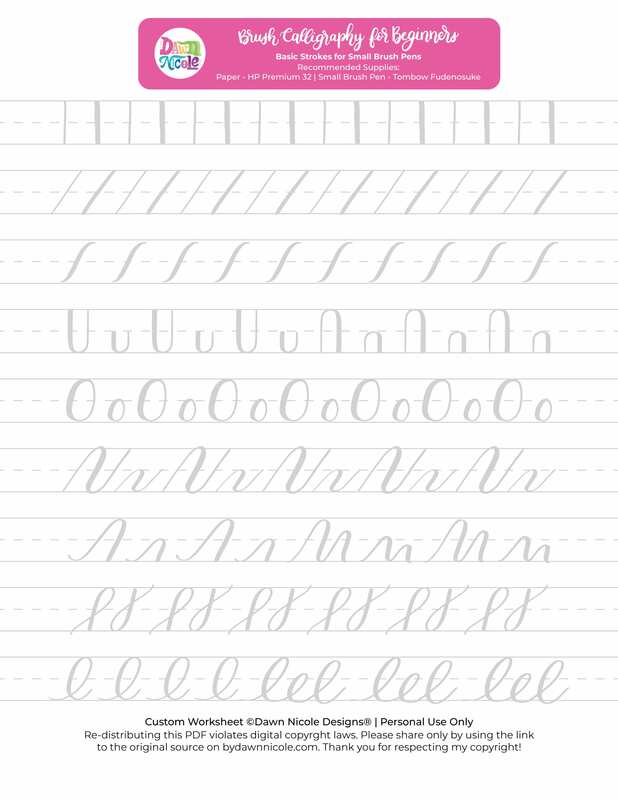 The new sets of Basic Strokes Worksheets include an expanded set of basic calligraphic strokes. These strokes are simply pieces of all the letters of the alphabet. These worksheets were designed for use with small brush pens. These are the supplies I recommend using. Don’t focus on making your strokes perfectly match mine. Focus more on the thin upstrokes and thick downstrokes part! Remember to use light pressure for the upstrokes and heavy pressure for the downstrokes. Go slow. Like super slow. Speed comes with practice and time but I find my work is most consistent when I keep it slow. Feel free to turn your page to get a better angle when needed. This video is a free mini bonus module from my Constellation Lettering Online Class. Want to learn Brush Lettering in a more in-depth way? Check out my 30 Days of Drills Workbook! Pop over to this post to get the set of Basic Strokes Worksheets for Large Brush Pens. Hey Dawn! Thank you for this great material, its so helpful! So, i didn’t find the Basic Strokes Worksheets for Large Brush Pen in the post for newbies, I think both have the same link. Despite my bad english, thank you for everything, you’re such a inspiration.